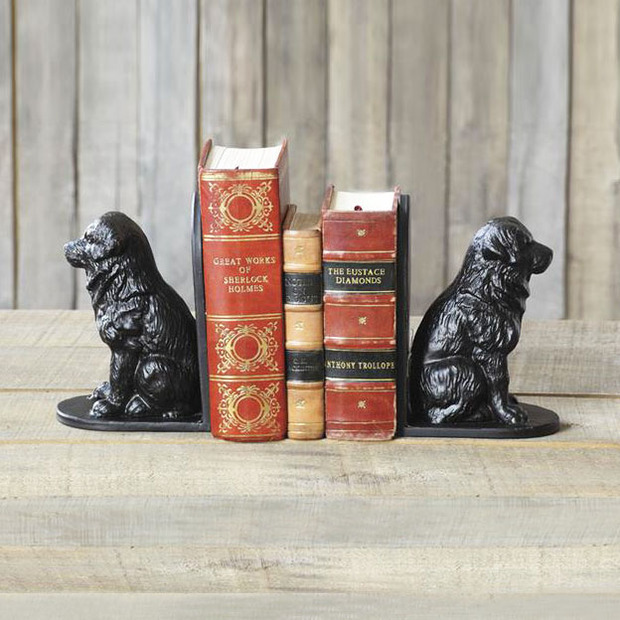 Dog bookends are the be-all, end-all gift for someone who loves dogs and books. Since I love both, I couldn’t resist posting this article. I still read most books on paper, and bookends really come in handy around my house and on my desk. They’re great for keeping cookbooks from falling over, or on a dining room table as a whimsical centerpiece. Here are the best ones I found. 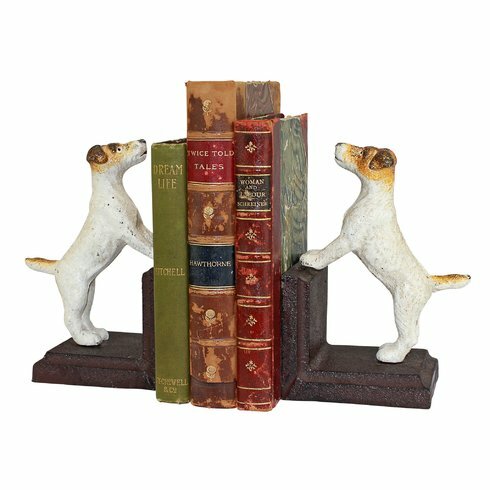 These two little cast iron Jack Russell terriers just aren’t tall enough to see over the wall of books! 6 inches tall by 4 inches wide. Weighs 3 lbs. Approx. $39. 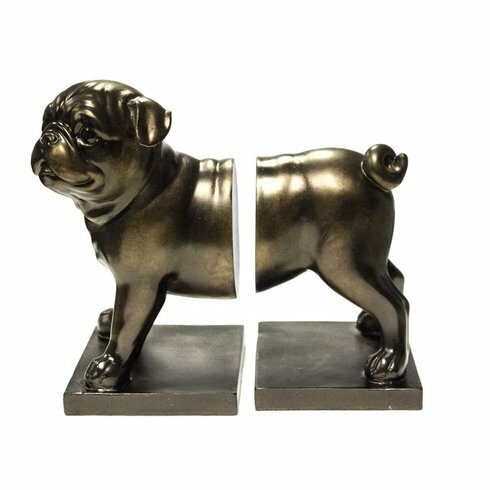 These dog bookends stand 6 inches tall and 4 inches wide. They’re made of metal and polyresin. Approx. $39. 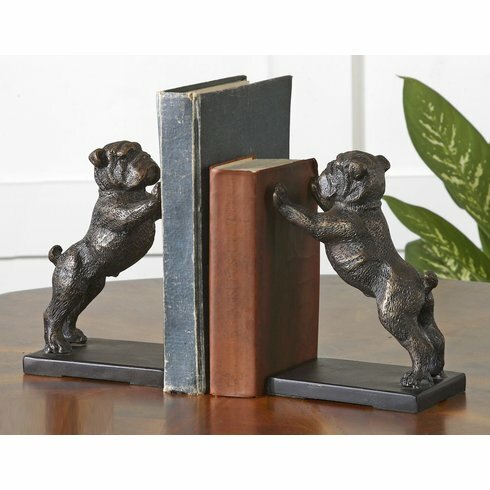 These cast iron cuties look determined to push the books over! They’re 6.5 inches tall and 4.5 inches wide. Together they weigh 6 lbs. Approx. $130. 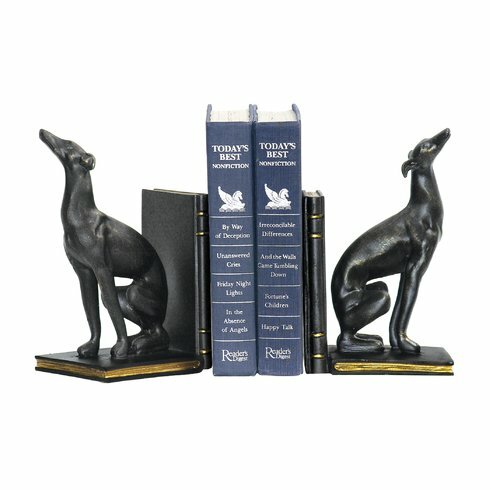 These bookends are 10.5 inches tall and 9 inches wide. They’re made of resin that has been painted black. $72. This little dachshund is made by Danya B of CEMENT. He reminds me of my mini dachshund, Cocoa. I love the look on his face — classic. $32. 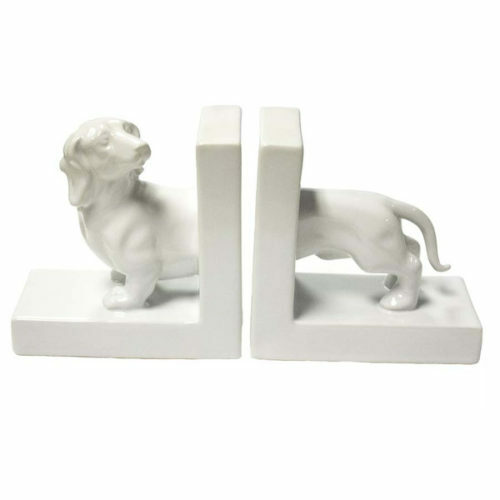 These vintage-looking Deco 79 bookends are made of polystone. They measure 8 inches x 6 inches. $32. 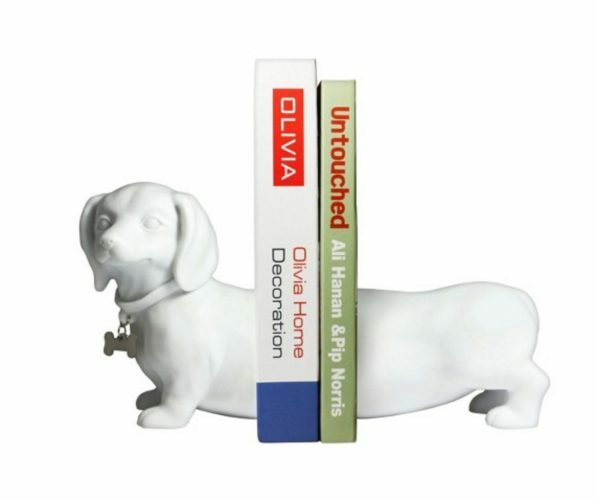 This dachshund is 5.5 inches tall and 11.25 inches wide. It weighs a whopping 11.25 lbs. and is made of ceramic. The expression on its face captures doxies’ natural curiosity. Also comes in green, black, and pink. 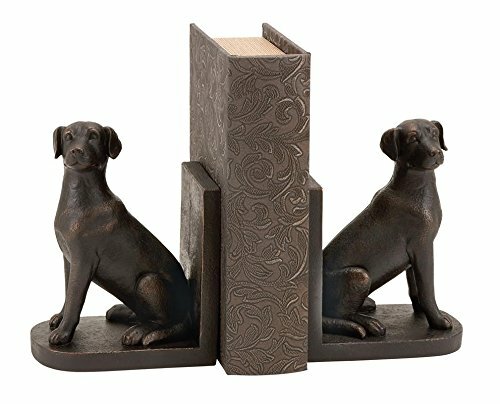 These dog bookends are also made from cast iron and cost $52 at Wayfair. They’re by Creative Co-op and the dimensions are 5” H x 3.75” W x 5.25” D. They also weight almost 8 pounds. Do you think they’re Saint Bernards? I like how these dogs each have their own doghouse. 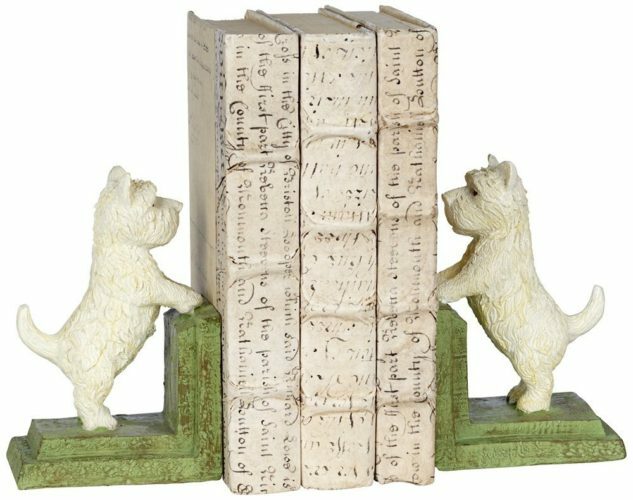 They cost $103 for the pair on The Classy Cottage website, are made of wood and resin, and are hand-painted. 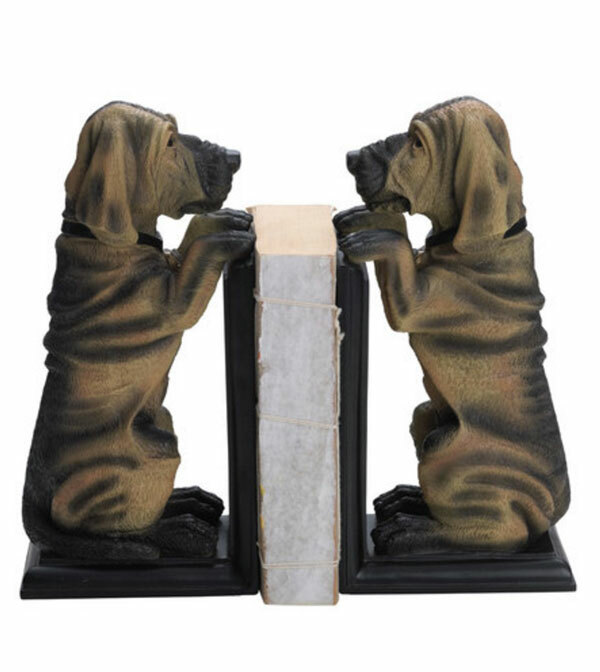 These Bombay Hawthorne polyresin dog bookends are 9.5 inches tall and cost $35. It’s adorable how they’re staring into each other’s eyes! 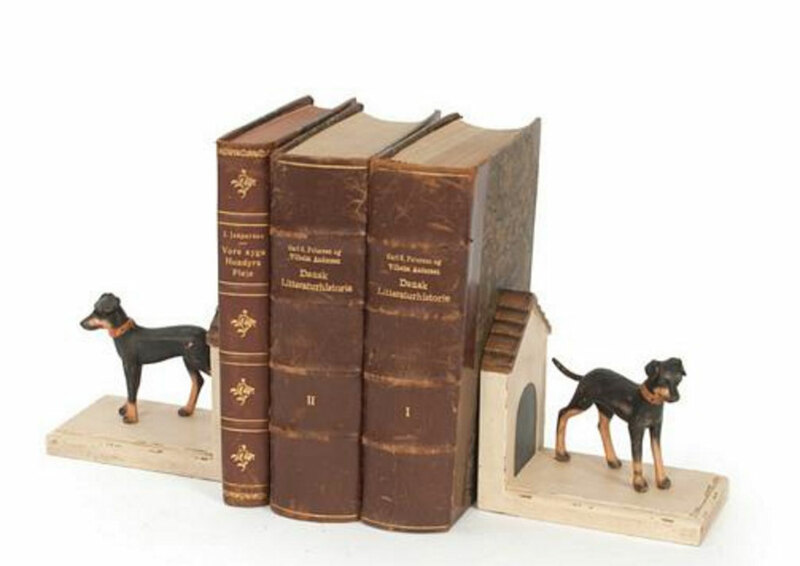 To get a sense of other bookends from past eras, check out these bookends from the 1920s. 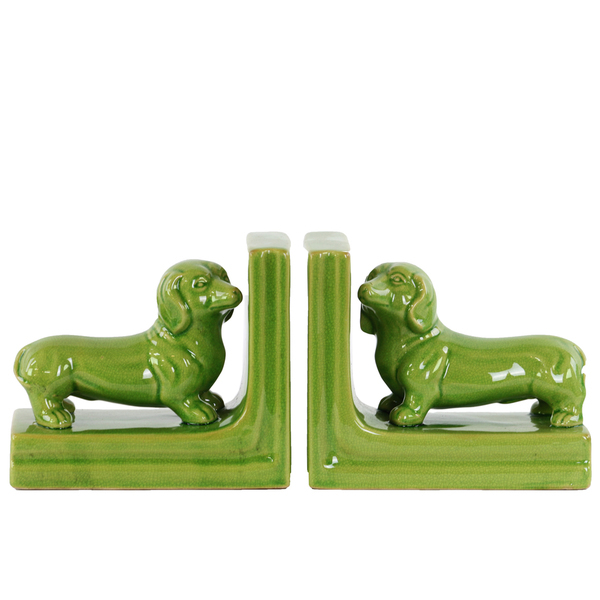 Which are your favorite dog bookends? Let me know!